Yes, it’s all about trust the bond horses have with a human. See it work here in this most excellent video Horsepower a video from Martin Clunes amazing and amazing it is too. It’s all about love for the horse. Just like other animals they can recognize love. They repay in kind over and over for their entire lives. Watch these horses enjoy a day at the beach. The still photo shown here is Lynn Baber and her special horse Bo in a moment of shared love and companionship. 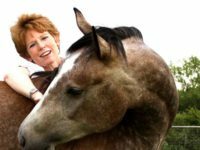 Lynn is an excellent writer and has some books out all about relationships: horses, God and humans. Check out her blog Lynn Baber.net – Simple Truth Simple Faith. Read her credentials – ask her a question or make a comment on some of her wonderful posts. I would love to have a viseo or DVD ofthe program or will it be shown again ? I have seen a i hour episode of Horsepower with Martin Clune on PBS. I know I missed a second episode last week. It does not appear that any other episodes are scheduled. Is it possible to purchase a video of these episodes for use in North America? How long is the series? Thank you , Bill, for your kind words. In my absence Bo is the leader of our herd and loves any and all attention!